My favourite summer song, ha ha ha, from high school years, 1984 my graduating year to be exact. Warm fuzzy feelings and all that, and a hit by a Canadian performer no less, making it all the more special to us. Of course, many players like to substitute the words “four-string” for the lyrics “six-string” when playing this on the ukulele. 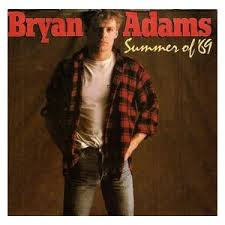 Bryan Adams classic. *Substitute G7 for G if preferred. [C] I got my first real six string – [G] bought it at the five & dime. [C] Played it ‘til my fingers bled – [G] was the summer of ’69. [C] Me and some guys from school, [G] had a band and we tried real hard. [C] Jimmy quit and Jody got married – [G] shoulda known, we’d never get far. [Dm] And if I [G7] had the choice –[C] yeah, I’d always [F] wanna be there. [Dm] Those were the [G7] best days of my [C] life. [C] Ain’t no use complaining, [G] when ya got a job to do. [C] Spent my evenings down at the drive-in, [G] and that’s when I met you – Yeah! [Dm] Standing on your [G7] mama’s porch, [C] you told me that you’d [F] wait forever. [Dm] And when I [G7] held your hand, [C] I knew that it was [F] now or never. Back in the summer of [G7] ’69! we [G] needed to un-[F] wind! I guess [Bb] nothing can last [C] forever – Forever! OH! [C] And now the times are changin’, [G] look at everything that’s come and gone. [Dm] Standing on your [G7] mama’s porch, [C] you told me it would [F] last forever. [Dm] And when I [G7] held your hand, [C] I knew that it was [F]now or never. Back in the summer of [G] ’69! Oh, [C] whoa. Back in the summer of [G] ’69! Oh, [C] yeah. Back in the summer of [G] ’69! Oh, [C] yeah…..